It’s almost Valentine’s Day. Valentine’s Day is a holiday that celebrates love. You don’t have to be romantically involved with someone to celebrate. You can buy a gift for anyone you love. I always get Noah something fun for Valentine’s Day. He always gets me something to show his love. I know that gifts don’t mean everything but it is nice to get or give a gift to someone. The traditional gifts are flowers and candy. If you want to get something nontraditional, I have a few ideas for you. They are great ideas if the person you love likes to cook. I partnered with Trudeau to check out some of their Valentine’s Day gadgets. Trudeau has so many wonderful products, you couldn’t go wrong with any of their products. I had a chance to check out the Bedside Espresso Maker, The Biana Espresso Cups and the Heart Shaped Silicone Egg and Pancake Mold. What’s espresso without the cute little cups? I love the Biana Espresso Cups because they are the perfect size for a nice hot cup of espresso to give your morning a kick! Noah likes to drink juice out of them because he thinks it’s cute. It’s also the perfect size for a tea party. 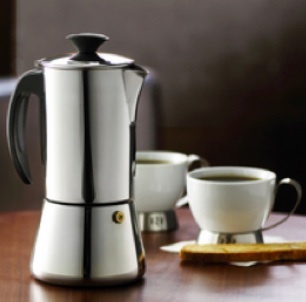 It keeps your espresso hot. 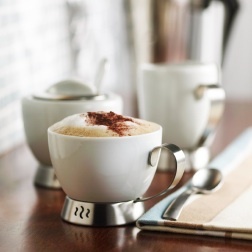 The Biana Espresso Cups are $6.99. 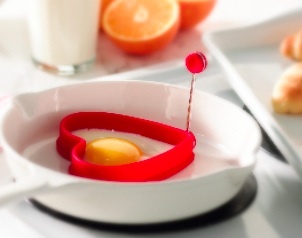 The heart shaped silicone egg and pancake mold is easy to use. I am horrible at making shaped pancakes. It never turns out right. I knew that you could use molds but I was never sure which ones were safe to use. It’s made out of silicone so it won’t melt and it won’t stick to the mold. I have heard of people using metal molds and it making a mess. It even has a handle to help you make the perfect heart shaped pancakes. We are starting a new tradition of heart shaped pancakes on Valentine’s Day. Noah was a little apprehensive about heart shaped pancakes, but I assured him that it’s ok. He can be really silly sometimes. I think that I will also use it for St. Patrick’s Day and try and make shamrocks out of the heart shape too. The Heart Shaped Silicone Egg and Pancake Mold is $5.99. That is very affordable and it’s fun to use. You can even get your kids in on the action. For more information check out the Trudeau Website. Hope you have an amazing Valentine’s Day. I received the products mentioned for review. All thoughts and opinions are my own.